Photos are courtesy of Legrand. One of the biggest trends in the facility management industry is the desire for permanent power in outdoor spaces. People have smartphones on them at all times, workers are more mobile than in the past with the help of laptops and tablets, and wireless internet signals are more prevalent. As a result, people are spending more time outside for class, work, and leisure activities. Whether it is outdoor classrooms, a courtyard in a commercial space, or retailers seeking options to let their customers charge personal devices, people now expect access to power in outdoor spaces. Facilities are using products not designed for outdoor use and trying to make them work. Many of the outdoor power products that are on the market have shortcomings that may pose potential safety hazards. 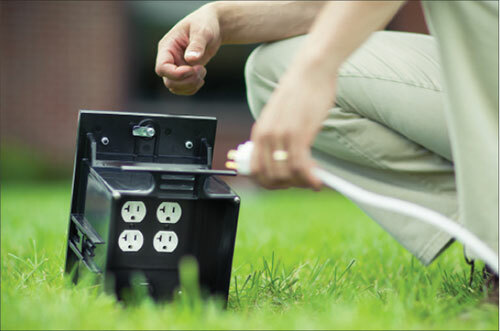 It is common to find in-ground power boxes that leak despite claiming to be waterproof, tangled wires running from a building to a courtyard, and above-ground posts that pose tripping hazards and are prone to damage by lawn equipment. It is not unusual to see people using receptacles meant for facility use, particularly in public places. Have you ever seen people charging their phones by utilizing a power source intended for public events or holiday light displays? I certainly have. This makes the inspector’s job increasingly challenging and puts them in the compromising position of evaluating set-ups that are essentially jerry-rigged and lacking third-party certifications, or that are not designed to be used in wet weather. Inspectors ensure compliance with the safety standards. Photo 2. An example of an outdoor ground box has an IP68 rating for protecting against water and dust and a NEMA 6P rating for withstanding “prolonged submersion” in water. Inspectors are now encountering two new types of products. One being outdoor in-ground boxes to provide power, data and audio-visual hookups. These are commonly found in commercial and hospitality facilities, event spaces, sports venues and educational settings. The other permanent outdoor power solution is outdoor charging stations for phones and tablets. 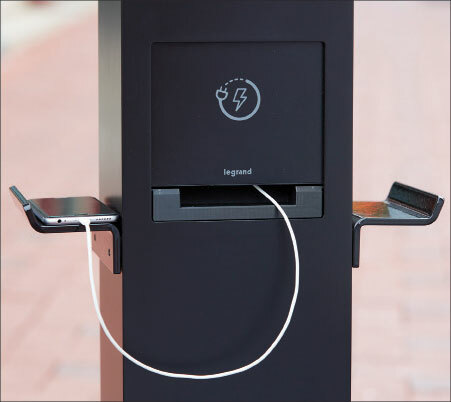 These are often installed in public spaces or spots where retailers and schools want customers and students to have the ability to charge their devices. Electrical inspectors must be able to validate the safety of these products, utilizing their knowledge of adopted codes and standards. Let’s take these products one at a time. Photo 3. Mobile technology is creating more demand for outdoor power, such as charging stations, and electrical inspectors are on the frontlines to ensure products are safe. UL, the global safety and certifications company, has established a new product category code (QCNL) and Outline of Investigation for Outdoor In-ground Boxes, UL 2996. Products listed to UL 2996 comply with all of the applicable construction requirements in the Standard for Nonmetallic Outlet Boxes, Flush-Device Boxes, and Covers, UL 514C. They are evaluated for chemical resistance, sunlight exposure, water absorption, flammability, submersion, hosedown, ice, fire resistance, slip resistance, and for the protection of installed electrical equipment against any of these environmental conditions. These products are also evaluated for compliance with the Structural Load testing from the Specification for Underground Enclosure Integrity, ANSI/SCTE 77 for the applicable tier rating based on the intended installation location of the enclosure. Based on the achieved rating, products may be listed for pedestrian traffic only or marked with a Tier 5 rating for use in sidewalk applications with a safety factor for non-deliberate vehicular traffic. Inspectors should look for products that have achieved a National Electrical Manufacturers Association (NEMA) or Standard for Enclosures for Electrical Equipment, Environmental Consideration, UL50E 6P rating. This means the wiring enclosure can withstand “prolonged submersion” in water. Another certification to be aware of is the International Protection (IP) rating for shielding against water and dust, such as IP67 or IP68. The first number in the code represents the level of protection against solid objects like dust, dirt and sand and ranges from 0 to 6. The second number represents the level of protection against entry of moisture and ranges from 0 to 8. An in-ground power box with an IP68 rating would have the highest protection covered under the code. An IP68 enclosure must be dust-tight, meaning it allows no ingress of dust and complete protection against contact. In addition, the enclosure must be protected in water immersion over 1 meter, and the equipment is suitable for continuous immersion under conditions as specified by the manufacturer. Normally, this means that the equipment is hermetically sealed. However, with certain types of equipment, it can mean that water can enter, but only in a manner that produces no harmful effects. Photo 4. Outdoor Charging Station, which is NEMA 3R rated for outdoor use, includes standard power outlets and USB outlets. Electrical inspectors should be aware of all National Electric Code (NEC) requirements related to products utilized outdoors. NEC Article 406.9 requires all 15- and 20-ampere, 125- and 250-volt non-locking receptacles used in damp or wet locations must be listed as weather-resistant (WR) type. Article 210.8 requires all outdoor receptacles to have ground-fault-circuit-interrupter protection installed in a readily accessible location. Mounting a GFCI device within an Outdoor In-ground box may present a safety hazard in the event that water enters the wiring enclosure. Many outdoor electrical products also have locked covers. It is for these reasons that UL requires that Outdoor In-Ground boxes be marked “GFCI Protected Remotely” or equivalent. The GFCI protection for these products may be provided at the panel via a circuit breaker or upstream of the product with a GFCI receptacle. If the circuit breaker is located more than 250 feet from the product, Legrand recommends that the GFCI be installed in a weatherproof enclosure closer to the ground box to avoid nuisance tripping. Outdoor In-ground boxes must be protected by a Class A GFCI device. Class A GFCI devices trip when the current to ground is 6 milliamperes or less and do not trip when it is less than 4 milliamperes. Electrical inspectors are starting to encounter more charging-related products outdoors. A prominent example is the pedestal-shaped charging stations that often have USB ports and standard outlets, allowing people to charge phones and tablets. 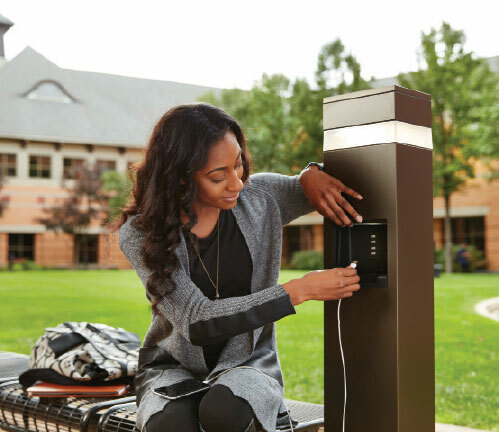 Outdoor charging stations should be UL listed to UL 1773, Standard for Termination Boxes, and adhere to the requirements of UL 231, Standard for Power Outlets, to ensure that the products provide safe access to power outdoors. Outdoor charging stations should be evaluated and marked as enclosures for indoor or outdoor locations (for example, UL 50E Type 3R). Products that have been tested and evaluated to comply with all applicable standards will withstand rain, snow, wind, sprinklers and salt air. UL 1773 covers mounting posts and pedestals rated 600-volt AC or less and intended to serve as a raceway for underground wiring that is being brought above grade to feed an outdoor electrical distribution device, such as a power outlet. The pedestal is intended to be mounted to a concrete slab, and the posts and pedestals are subject to torque deformation test and beam loading deflection test. Photo 5. Code compliance, product testing and proper installation are three important factors for inspectors evaluating outdoor power setups. Outdoor charging stations should also adhere to the UL 231, Standard for Power Outlets to ensure the products safely provide outdoor power access. UL 231 says an enclosure shall be constructed to withstand beating rain and splashing water as determined by application of the requirements specified in rain and splash tests. Another outdoor rating to look for on charging stations is NEMA Type 3R for use in all weather conditions and climates. Many inspectors are asking whether USB ports in charging pedestals need to be weather resistant to meet code. The short answer is no. USB outlets are not covered by NEC 406.9, which was explained earlier in this article. Instead, USBs are classified as Class 2 Power Supplies and are subject to UL 1310. Reputable manufacturers will still test their outdoor USB components, such as splash testing and rain testing to ensure they’re safe. Inspectors should also verify that outdoor charging stations comply with the Americans with Disabilities Act (ADA). Section 309.4 states that a person must be able to operate the parts with one hand and by exerting no more than 5 pounds of pressure. Section 308.2 requires an unobstructed forward reach to the charging area of between 15 and 48 inches above the ground. Section 307.3 deals with protruding and post-mounted objects, which could apply to the shelves of a charging station. Per the code, the shelves would need to be mounted at least 27 inches above the ground if they are entering a circulation path. If they are not in a designated circulation path, then there is no issue. In addition, the requirement is that they extend no more than 12 inches. Even with third-party certifications, electrical inspectors want to know what sort of testing a product underwent, especially products new to the market like some outdoor charging stations and in-ground boxes. Legrand and other reputable manufacturers understand inspectors’ concerns and have begun to provide access to product testing videos. The following tests are viewable on Legrand’s website (www.legrand.us): load rating, cover impact test, cold submersion test, flammability test, and more. It’s equally important to know how products perform in the real world. Traditionally, just about the only way to attempt to waterproof an in-ground power box was to use heavy-duty gaskets and a couple of dozen bolts on the cover. There are products that could pass the lab tests but almost never hold up once they are installed. Water eventually gets in. Sometimes all it takes is a grain of sand to make a gasket system fail. It is critical that products be validated for use in the real world. Product effectiveness and safety also will depend on installation. Installation is going to largely be based on manufacturer recommendations, but for in-ground boxes, some general rules of thumb should always be followed. First, know the soil they are going in and put them in areas that drain well. Poor soil, like clay, is not a good option for the boxes. Thankfully, the landscape is changing when it comes to permanent outdoor power. Based on consumer demands, electrical manufacturers have developed new permanent outdoor solutions that are safer, more convenient and more reliable than previous outdoor electrical products. But electrical inspectors still have their work cut out for them. Questionable products and installations remain common. And the newness of many safer, code-compliant products will create questions and require close inspection. Armed with a firm understanding of codes and best practices, electrical inspectors should be well prepared to evaluate these products as the outdoor power trend continues to grow. Mike Diamantoplos serves as Compliance Manager for Wiremold products at Legrand North America. In his role, Mike is responsible for managing the third-party certification (UL, ETL, CSA, TUV, CE, PSE, etc.) listing process, gaining and maintaining listing compliance of all Wiremold products. He provides guidance and support to local engineering staff to ensure all products comply with NEC requirements and normative standards.